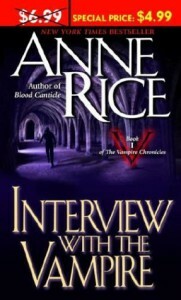 I love Anne Rice so I abhor saying this but...Louis is one of the worst characters ever. He's so annoyingly emo that I want to stake him, chop his head off, and throw him in a swap just to shut him up. He's beautiful, immortal but didn't have a choice about it, rich, blah, blah, blah. Get over it. I understand he was lonely, etc but wow... A gazillion pages of constant bitching and whining annoyed me to no end. Lestat, however, made the book. Sure, he's flamboyant, a little crazy, somewhat cruel, but man is he one of those people (supernatural creatures?) that you can't take your eyes off of. Claudia was kind of a non-entity for me and Armand was okay, kind of emo too. Still, I lived the book. I read it the first time in high school and a few times since. Ms. Rice is incredibly talented that's for sure!